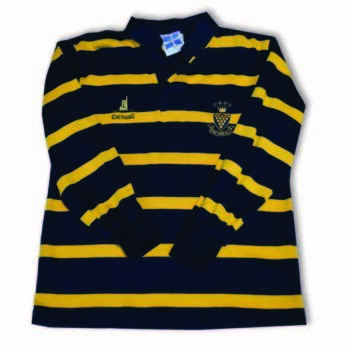 Cornish Rugby Shirt childrens retro design. Traditional Cornish rugby shirt with long sleeves. Black with gold horizontal stripe. Black placket, cuffs and collar.100% cotton fashion weight. Gold embroidered “CRFU” (Cornish Rugby Football Union). Made in Cornwall.